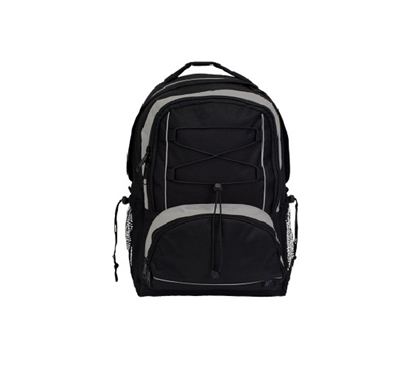 Made of 600HD Polyester - Water Resistant, Beyond Durable Bag for College! Dorm Co. Tip: A durable bag is a dorm necessity for going to your college courses! You thought you could get away without a college backpack in college, didn't you? Sadly, you also need this dorm essential even when you're in college. Actually, you need a dorm backpack even more in college than you did in high school. When you were in high school, you had lockers to put everything in. In college, you're going to be going from your dorm room to your college courses and may have three or more classes back to back with little time between. In other words there won't be enough time to go back to your college dorm room for your college supplies for class. Make sure you have a durable college backpack like our Blackhawk College Backpack as part of your dorm essentials list! When we say our Blackhawk College Backpack, we aren't kidding. It's made of 600HD polyester, which doesn't sound like much when you say it like that. What it means though is that this college backpack is water resistant and beyond durable. It's going withstand tough college use, which is exactly what you want and need in this college supplies product. You're going to be carrying a lot of college supplies to your college courses - college textbooks (yes, more than one), notebooks, writing utensils - and those are just the basics. You're also going to have your smartphone, college student ID and more. You don't want to drop any of those dorm essentials on your way to class and have them get damaged. Keep them in this heavy duty college backpack on your way to your college classes and you will be glad you did!